Magical knitting. How do you define it? For me, it’s knitting for my relatives and seeing them enjoy the handknits I spend so much time making, just for them. Knitting for our nephews has been particularly enjoyable. One of them, Henry, especially enjoys my knits; I think that’s pretty special for a 13-year-old. 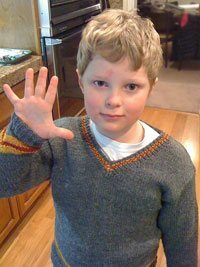 About six years ago, Henry was deep into the shenanigans of Harry Potter & Co. Immersed into their magical world, Henry requested a knitted sweater for his favorite “house.” So, I knit him a gray, yellow, and red V-neck pullover, representing the best house, Gryffindor. Henry in the Gryffindor sweater. Sweetness personified! I didn’t have a pattern for the sweater, so I pulled out my go-to resource, Ann Budd’s Handy Book of Sweater Patterns. Using her tried-and-true formulas, I was able to design the perfect house sweater for my favorite little wizard. It truly was magical knitting when he tried it on and thanked me, all smiles and hugs. I treasure that memory. Fast forward to 2018, and our other nephew, Sam, discovered the wonder of J.A. Jance’s world. He fell for the wizarding tales as hard as Henry had and wanted the same sweater. I knew Henry had grown out of his, and that his romance with the books had waned, so I asked him if I could pass his sweater on to Sam. “Sure, Auntie Kath,” he said, “Sam will have fun wearing it!” So very sweet. And lucky me—I got to see another nephew’s eyes light up with happiness and wonder as he opened his “new” sweater. Sam immediately put it on ad then ran upstairs to get his glasses, scar decal, and wand. This is some serious magical knitting! 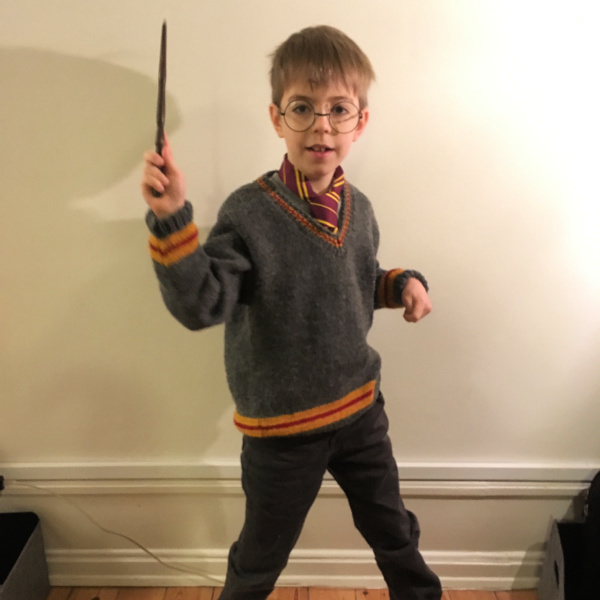 Sam in the Gryffindor sweater; the perfect little Harry! Knitting for my nephews is so special. If you have a Potter-loving little boy (or girl!) in your life who needs a wizarding knit, check out The Unofficial Harry Potter Knits. 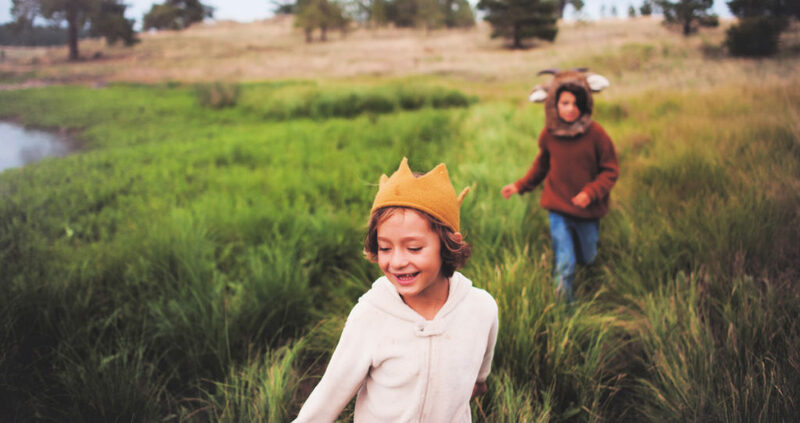 You’ll find the perfect magical knit for him or her! Henry’s latest request is a pair of fingerless gloves in neon green and black, which must be from some video game or something. I’m not up on what the kids today are doing, but I am willing to outfit them.